67 total news articles in this section, 10 per page. 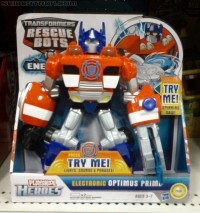 Great news for you Transformers: Rescue Bots fans, the latest wave of figures has been sighted at retail! Our fearless leader Seibertron spotted the non-transforming Energize Optimus Prime at a Target in Rosemont, IL priced at $27.00. His wavemate Bumblebee was nowhere to be found, but fellow Seibertron.com member RickWJ324 purchased the pair on eBay and supplied us with an image as well. Well that was quick! We already have our first retail sighting of Transformers Prime "Beast Hunters" Deluxe Wave 1, which features remolded Wheeljack, Bumblebee, Soundwave, and the brand new mold Laserback. Not only that, we also have new Transformers Bot Shots Box Sets featuring the Stunticons and the Autobot Polar Assault Team. The Stunticon set is comprised of Motorbreath, Dead End, Dragstrip, Brake-Neck, and Breakdown, while the Polar Assault Team is made up of Optimus Prime, Bumblebee, Jetfire, Ironhide, and Mirage. All were discovered at a Toys"R"Us location in Southern California by Twin Cast, who images have been mirrored below. 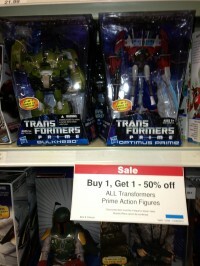 Great news folks, the last figure in the Transformers Prime "Robots in Disguise" line has been spotted in the US! Seibertron member megatronis found Voyager Class Skyquake at Bedrock City Comics in Webster, TX. 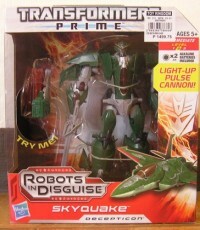 Skyquake is the final figure scheduled for release in the Transformers Prime "Robots in Disguise" line, before switching over to Transformers Prime "Beast Hunters" in 2013. Keep in mind, specialty shops often get new items ahead of mass retailers, but it's good to see this guy Stateside none the less. Well, it looks like the discount retailers are at it again. This time it's Prime Deluxes! The latest waves, no less! Nutimus Prime wrote: I just grabbed Thundertron at TJ Maxx yesterday for $13. 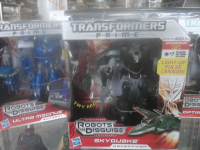 What does this mean for the assortment with Skyquake, the last PRID figure? Only time will tell. Keep your optics tuned to Seibertron.com for the latest news and updates! We just reported that Transformers Generations Voyager Wave one featuring Fall of Cybertron Soundwave with Laserbeak and Soundblaster with Buzzsaw was available online at Toys"R"Us, but if you're more of a brick-n-mortar toy hunter we have some more good news! 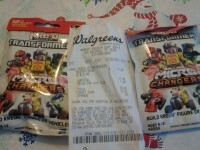 Voyager Wave One has been spotted at retail along with the Data Disc minions wave one! The figures were found at a Toys"R"Us location in Indio, California by Floating Cat. The Data Disc sets are made up of Ravage & Rumble and Ratbat & Frenzy. Happy hunting! Hey there! I stumbled across the Generations FoC Soundwave & Soundblaster today on the Toys"R"Us website. The way they were listed was kinda tricky. It didn't show up on searching "soundwave"...but when typing the name in the search it showed up. (guess it's because the name lists "Soundwave/Laserbeak". In case this is of interest to anyone! Needless to say, my order was placed, and I already have my confirmation e-mail! I peeked in the forums, but didn't see anything about this yet...so just thought that I would share the good news! Both are priced at $22.99 and will most likely sell out fast, so hit the buy button asap! As we previously reported here. Toys R Us has been carrying the once Asia only GDO Legends, Scout, Deluxes and Voyager Classes line and it's been a pretty big seller. Most brick & mortar stores have sold out, and TRU's own website has sold out more than once. Free shipping with an "R" us credit card. These won't last long, so strike while the iron's hot! The highly anticipated Transformers Prime Voyager Class Skyquake has made his initial retail appearance in the Philippines. Skyqauke is the last figure scheduled to release in the Transformers Prime "Robots in Disguise" line as part of the Voyager Wave 4 revision, and as we all know that can lead to sparse distribution. Let's keep our fingers crossed that isn't the case with this guy. Sighting and images below courtesy of deviantART user BoggeyDan. TFW2005 member slackerforhire has posted pics proving he found First Edition Voyagers Optimus and Bulkhead at the 6926 South Lindbergh Boulevard, St. Louis, MO Toys R Us location. As we previously reported here, the Hasbro panel (and display case) at SDCC '12 confirmed that we'd finally see these at US retail as a TRU exclusive. It should be noted that these First Editions aren't exact duplicates of the first run First Editions from last year. -Optimus is missing paint apps on his doors, shown here. -Bulkhead's arms have a bicep swivel joint that has a stress mark on both pegs. (There are no reported breaks, just stress marks. The stress marks are hidden when the arms are attached.) Due to this the arms tend to pop off during transformation or posing. Please, remember to use our sightings forum, here, to post your latest findings, it really does help your fellow board members and friends!